Cisco is introducing a new router that will be able to handle the dramatic increase in demand for Internet downloads. If Internet traffic is going to triple over the next five years, as Cisco predicts, we're gonna need a bigger boat. On Wednesday, Cisco (CSCO) unveiled its latest solution to help wireless carriers and Internet service providers manage their customers' insatiable demand for more streaming videos, app downloads and social networking. The new core router technology, known as "CRS-X," will provide speeds of 400 Gigabits per second -- and that's just for one slot on the router's rack. Each rack is scalable up to 6.4 Terabits per second, and the entire CRS-X system is capable of nearly 1 Petabit per second if multiple racks are set up in tandem. That is insanely fast -- double anything that currently exists on the market. A single CRS-X rack will be able to provide streaming HD video to every New Yorker simultaneously, Cisco claims. A full, multichassis setup is capable of downloading the entire printed collection of the Library of Congress in a split second and can stream every movie ever created in about a minute. Core routers sit at the epicenter of the Internet, serving as the traffic cops at the biggest intersections on the busiest data highways. They connect visitors' requests to sites like Google (GOOG), Netflix (NFLX) and Facebook (FB) and they send data back to the right place in return. They're a crucial part of the Internet backbone, and one that Cisco has a comfortable lead in. Cisco has 750 CRS customers, selling 10,000 systems to date, and it commands a roughly 65% share of the core routing market. That's more than double No. 2 Juniper's (JNPR) share. 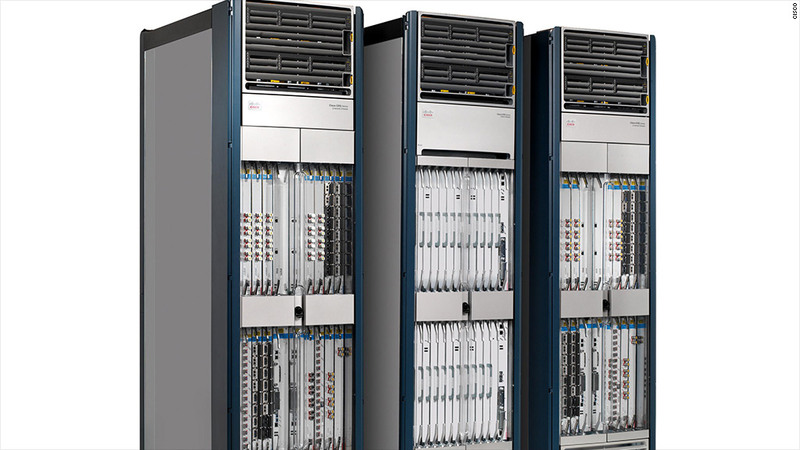 Cisco says its solution is cheaper than Juniper's offerings. For instance, customers who installed Cisco's previous core router, dubbed CRS-3, in 2010, can upgrade to CRS-X by simply swapping out their CRS-3 cards for the new ones. In previous updates, Juniper has required customers to buy entire new router setups to upgrade their systems. "It's as easy as putting in new line cards," said Stephen Liu, Cisco's director of service provider marketing. "For all intents and purposes, it'll then be a CRS-X -- except for what the paint on the outside says." Cisco says the CRS-X will help customers prepare for the "Internet of Everything," a much-discussed (but yet-to-arrive) world in which household items, cars and even clothing will connect to the Internet. Instead of connecting 4 million devices simultaneously, carriers and ISPs may soon need to connect 40 million items at the same time. That's why modern core routers like the CRS-X manage different kinds of traffic in separate ways. You'll have a miserable experience if your Netflix video stream keeps getting interrupted, but you likely wouldn't notice if it takes a split second longer to load a website. "The innovation our customers are getting isn't just about faster speeds and more lanes on the highway," said Liu. "It's more like a GPS system that helps you find the best path based on traffic congestion." Though the CRS-X won't go on sale until the fall or even begin shipping until the end of 2013, customers are already saying they're impressed. Mike Haberman, vice president of network operations at Verizon (VZ) Wireless said the new CRS system will help the nation's largest wireless provider meet its service demands "well into the future."